An Earth-friendly Companion to the Backyard Composter! The Green Cone Digester is a smart, easy-to-use, efficient household tool, which reduces waste and eliminates most of the problem of food disposal. It’s a clean, healthy way to minimize your family’s kitchen trash while helping the environment. 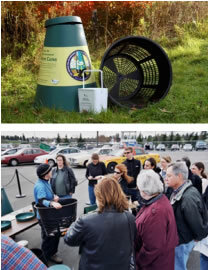 The Green Cone is primarily constructed from recycled materials, and the digestion basket and inner solar chamber are made from 100% recycled plastic. The Green Cone Digester is designed to accelerate the natural decomposition process by raising temperatures, maintaining aerobic conditions, and encouraging the growth of micro-organisms. The system processes almost all household food waste, including vegetable scraps, raw and cooked meat or fish, bones, dairy products and other organic food waste such as bread and pasta. What is the Green Cone? The Green Cone is comprised of a lower basket installed below the ground, which forms the base for an above ground double-walled solar chamber with an access lid. The Green Cone stands 26 inches above ground level and extends 18 inches below ground level. Access is through an 8-inch diameter hole in the top of the solar chamber, which is sealed by a hinged lid with a security catch. The design of the Green Cone uses solar heating in the double-walled chamber to facilitate and accelerate the aerobic decomposition process within the digestion basket. Therefore, the system should be installed to obtain the maximum sunlight in your backyard. The one-gallon sealable Kitchen Compost Caddy is recommended for collecting and carrying the food waste to the Green Cone. The Green Cone will digest approximately 5 kg/11 lbs of food waste a week, which is over 25% greater than that produced by the average household. The food waste is converted into water, carbon dioxide and a small amount residue, without the need for mixing or turning the waste. In a well operating system the residue will occupy the bottom 10 inches of the digestion basket after the decomposition of about a ton of food waste. Thus, after about five years this small quantity of residue must be removed and dug into the garden sub-soil. The Green Cone takes all household food waste, including vegetable scraps, raw and cooked meat or fish, bones, dairy products and other organic kitchen waste (e.g. tea bags, bread, etc.). Your Green Cone is shipped with a 4 litre Kitchen Compost Caddy for collecting and carrying household food waste to the unit. The patented design of the unit utilizes a solar heating effect between the inner and outer cones to promote air circulation, which facilitates the growth of beneficial micro-organisms and the desirable aerobic digestion process. The household food waste is converted into water, carbon dioxide and a small amount of residue. Because over 90% of the waste material in the Green Cone is absorbed safely as water by the soil, the Green Cone only needs to be cleaned once every few years when treated with care. Once The Green Cone is properly installed, it will soon become an invaluable household tool that you’ll use every day. The Kitchen Compost Caddy is a convenient accessory that is kept in your kitchen to reduce the number of trips you make to your Green Cone. Throughout the day, food waste is stored in the caddy before it is taken to your Green Cone. The lid of the caddy contains a charcoal filter to eliminate any possible odours in your kitchen. Your Green Cone will come with Compost Accelerator – which is a combination of environmentally friendly active micro-organisms and powerful blend of beneficial enzymes, super catalyzing co-enzymes and co-factors with a remarkable ability to fully digest a wide range of compounds and pollutants which sanitizes and leaves the environment in natural balance. It is a natural 100% organic and biodegradable culture that uses no harsh chemicals or residues. Compost Accelerator vastly improves the Cone’s digestion process, especially when it can’t enjoy a full day of sunshine, or during the colder months of winter. 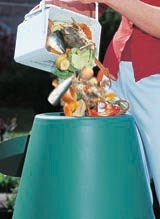 Simply add the powder into the caddy before emptying the food waste into the Green Cone. It is also beneficial to use the powder for the first week after the installation of the Green Cone to encourage the initial growth of bacteria. The Green Cone is an integral part of dealing with your household waste. It eliminates your cooked and uncooked kitchen food waste, including meat, fish, bones, dairy products, vegetables, fruit, peelings, etc. Other household waste (i.e. non-kitchen waste) must not be put into the Green Cone, but disposed of in methods approved by local community guidelines. Food waste should be transferred as soon as practical from the kitchen to the Green Cone, which allows food waste to be removed daily. Once deposited in the below ground digestion basket, there is no possibility for unintentional access to the food waste by human activity. As with any gardening activity, particularly those involving soil or compost, gloves should be worn when removing the small amount of residue that accumulates in the digestion basket after several years of operation. Temperatures in the solar chamber of the Green Cone reach up to 122°F/50º C for long periods during summer months. Because of these ideal conditions, indigenous microorganisms grow while harmful pathogens die, through competition for nutrients. ** Due to the effectiveness of the Green Cone in controlling decomposition process, and the inaccessibility to animals, birds and humans, the overall health, safety and environmental risk of using the Green Cone is virtually nonexistent. However, we still recommend locating your Green Cone away from any food gardening area. We also recommend locating the Green Cone at least 100 feet from any well/water source. Your Green Cone needs very little maintenance. However, it is important to ensure that the top of the basket and the bottom lip of the outer green cone are below ground level and always fully covered with soil. In a well-operating Green Cone, very little waste residue will be produced. Should the residue build up to ground level and not decrease, the cones can be removed to access the basket. The harmless residue can then be buried into any suitable area of the ground. 1. Choose a sunny spot in the garden — the sunnier the better. 2. The Green Cone converts food waste primarily into water and carbon dioxide. The water produced must be able to drain freely away; otherwise the Green Cone will become anaerobic (without oxygen) and will cease to work. It is therefore crucial to install your Green Cone in an area of good drainage. Under no circumstances should the base of the basket be below the water table or where water gathers. If you believe your soil drains well, dig a hole 32″ wide and 24″ deep. Then pour a bucket of water into the hole. If the water disappears in less than 5 minutes, you have good drainage. If the water remains for more than 15 minutes, you have poor drainage or if you live in an area of heavy clay or chalk where drainage isn’t as good, you will need to dig a hole 36″ wide and 28″ deep. 3. Mix some of the soil from the hole with gravel and/or compost for backfilling later. In areas of heavy clay or chalk, include gravel, small stones, small pieces of broken terracotta pots, or small pieces of broken bricks in the mixture to aid drainage. 4. Place the mixture in the base of the hole so that the base of the basket is 1″ below ground level at the base of the hole. 5. Place the assembled Green Cone in the hole. Ensure the top of the black basket and the bottom lips of the green outer cone and black liner are below ground level. 6. Backfill the gap around the Green Cone with the mixture until the bottom lip of the Green Cone is fully covered. 7. Your Green Cone is now ready for years of productive use. Be sure to periodically check your soil level, which may drop with heavy rain. To check, make sure that the bottom lip of the green outer cone is fully covered, adding backfill as needed. No. Chemicals can kill or disrupt the bacteria breaking down the food waste. The only activator that is recommended for use is the all-natural Green Cone Compost Accelerator. • The Green Cone is installed in a very dark, shady area. • The surrounding soil isn’t well-drained, or if the soil contains heavy clay or chalk. • The black basket is below the water table or in an area where water collects. In these circumstances, the Green Cone’s digestion process could turn anaerobic (without oxygen). You can tell that by examining the food waste. If it looks wet and slimy, the Green Cone should be reinstalled. In periods of very cold weather the digestion process may slow down due to lack of natural bacteria. This would be evident by the level of waste in the basket not decreasing. Under these circumstances, the addition of the natural Green Cone Compost Accelerator should restore the bacteria population and restart the digestion process. Provided your Green Cone has been correctly installed, 1-1/2 to 2 pounds (roughly one gallon) of food waste can be placed in your Green Cone every day. This amount is typical of that produced by a family of four. The precise quantity of waste digested by your Green Cone each day will depend upon the ambient temperature, the population of bacteria and the mix of food waste you produce. The bar across the mouth of the Green Cone provides some rigidity in storage and transit. Its purpose is to prevent small children climbing into the Green Cone. However, turning the twist-lock on the lid and serves the same purpose. The bar may safely be removed (carefully using a hacksaw) to allow large scraps to be put more easily into the Green Cone. However, if you alter (i.e. remove the safety bar) the Green Cone in any way, even if it is brand new and unused, it is not returnable under any circumstances. The Green Cone is a sealed unit and when properly installed, emits no odours. It does not, therefore, attract flies. However, the eggs of fruit flies are already in the skins of many fruits and can hatch out in the Green Cone. Similarly, if food or food waste is not kept covered prior to going into the Green Cone, it’s possible for a housefly to lay eggs before the food reaches the Green Cone. These would also produce maggots and flies in the Green Cone. Good housekeeping is therefore important. Some people will freeze food scraps before depositing them into the Green Cone. This may significantly reduce the possibility of flies–should they occur at all. Will the Green Cone attract critters? If correctly installed, your Green Cone will not attract critters. By ensuring that the top of the black basket and the bottom lip of the green outer cone are below ground level, you will harmlessly filter out any odours into the surrounding soil. It is also important not to spill food near the Green Cone. If you already have rats on the premises, they may try to chew through the Green Cone to access the food waste inside. If you think there is a chance of this happening you should put chicken wire around the black basket to prevent a rat or other critter from gnawing its way through into the waste. In a well-operating Green Cone, the waste residue will only need to be removed every few years and certainly no more than once a year. It requires emptying when the residue builds up to about 4 inches below ground level and shows no signs of reducing. Yes. Your Green Cone works 365 days a year. The level of food waste may rise during winter but should drop down when the weather gets warmer. If decomposition slows during very cold periods, use the natural compost accelerator. First, remove the filter by snapping it off of its holder, then hand-wash the caddy in warm soapy water. How do I purchase more Compost Accelerator? Compost Activator packages may be purchased online through a variety of sellers. You may purchase the activator directly from the manufacturer at www.compostec.ca . The Authority has extra packages of activator to purchase at the Truckload Sales. You can call the Essex-Windsor Solid Waste Authority for more information regarding the Green Cone Digester. Call 1-800-563-3377.